I began writing out of desperation and a cherished dream. While recovering from breast cancer, I went into a chemo-induced depression without realising it. I had no idea what was wrong, only that the ground beneath me seemed to have collapsed. Months passed. When I still found no equilibrium, a counsellor at the cancer charity Macmillan suggested a bout of creative writing. I took her advice, and began a short story about my grandfather's favourite chair. I really did not know what I was doing, except that putting words onto a page made me feel better. I showed the story to a friend who is a professional editor, and she encouraged me to continue writing. Not long afterwards, I recalled a dream I'd once had, of writing a novel loosely inspired by my great-grandmother's life. I never met Great Grandma, I only heard about her. Stories were re-hashed endlessly in my family about this formidable woman who, despite being uneducated, started a business at a time when few women in Malaya ran businesses. She always seemed larger than life - a true role model in a profoundly patriarchal culture. I began my writing project by doing research and, at the same time, by jotting down a story structure. I knew that what I wanted to write was not a biography but a novel based on historical events, possibly even on events that my family had experienced. My characters, though, would be wholly made up. Armed with a detailed outline, I planned a trip to Malaysia, where I ate copious amounts of the food that features in my debut novel, The Woman Who Breathed Two Worlds. I pored through newspapers in the National Archives and interviewed anyone who would talk to me. Many Malaysians are nostalgic for the old days, and were delighted to share their memories. Some who gave their time were family members - aunts, uncles and cousins - but a few were people I barely knew. Amazingly, I came across people who had actually met my great-grandmother. Seventy years later they still remembered her - because she had been so fierce! Their anecdotes provided a wonderful tapestry that fuelled my imagination further. Spurred on by Malaysia's heat and its panoply of aromas, sounds and colours, I began writing the first draft of The Woman Who Breathed Two Worlds. 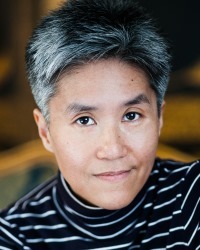 The story follows the life of a mixed-race woman during a time of rapid change, and is a complex and rich story about food, family and cultural identity. It is set in my hometown, Ipoh, which used to be a famous mining town. As I described the modernisation of the town and how the protagonist tries to retain her cultural traditions in her rapidly Westernising world, I realised I was telling not only her story but the story of her country. In this way, the Malayan Series was born. My new novel, When the Future Comes Too Soon, follows on from the first book, but the two can be read independently and are very different. In this second novel Malaya is at war. There is a new protagonist, Mei Foong (the daughter-in-law of the heroine in the first book), who is thrown into a world gone mad. Somehow, she must find ways to keep her family alive. Their story is as much about betrayal, in its many forms, as it is about survival and love and what courage means. Sometimes, it takes extreme circumstances for people to discover what they're made of. This is the case for Mei Foong, who finds her inner steel through war and suffering. The stresses of war were immense for most Malayans. Yet what happened in Southeast Asia is often overlooked; people know about WWII mainly through what happened in Europe. If the Malayan war story has been told at all, it has been from a colonial perspective - involving the resistance, for instance, the so-called tiny band of Force 136, which actually had little impact on the vast majority of Malayans. In When the Future Comes Too Soon, I try to show the reader what the Japanese occupation was like from the viewpoint of an ordinary Malayan family. For this reason, the Asian Review of Books has described the novel as "an important corrective, as well as an exciting read". I'm glad they added the latter - because my aim was not to correct or enlighten, only to entertain! 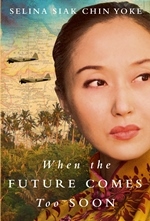 When the Futures Comes Too Soon by Selina Siak Chin Yoke is out now (Amazon Crossing).